Isolated in the mountains of Nicaragua, the tiny village of Las Cureñas is home to a small group of indigenous women that dedicate their lives to preserving the pre-Columbian heritage of black pottery. When visiting the village, Inde Creative recognized black pottery as an important part of Nicaraguan culture, and identified the unique art as a viable enterprise opportunity for the local women, with potential for economic development and positive community impact. Phase 1 Inde Creative produced and published a bi-lingual coffee table book documenting the history and production process of indigenous black pottery in Nicaragua, and telling the stories of the industrious women artisans who have kept the tradition of their ancestors alive today. All time and talent was volunteered in the production of the book, minimizing project cost. Book sales cover the cost of production and printing, making the project self-sustainable. Complimentary copies of the book are distributed to coffee shops, hotels, eco-lodges, museums, libraries, and universities throughout Nicaragua to promote indigenous black pottery, drive tourism to the Las Cureñas community, and stimulate economic development. Click here to support project expansion. 100% of net proceeds from book sales are donated to support the development and promotion of indigenous black pottery in Nicaragua. That means when you purchase a book, you’re also making a donation that goes directly to the women’s cooperative to bring economic development to a community in need. 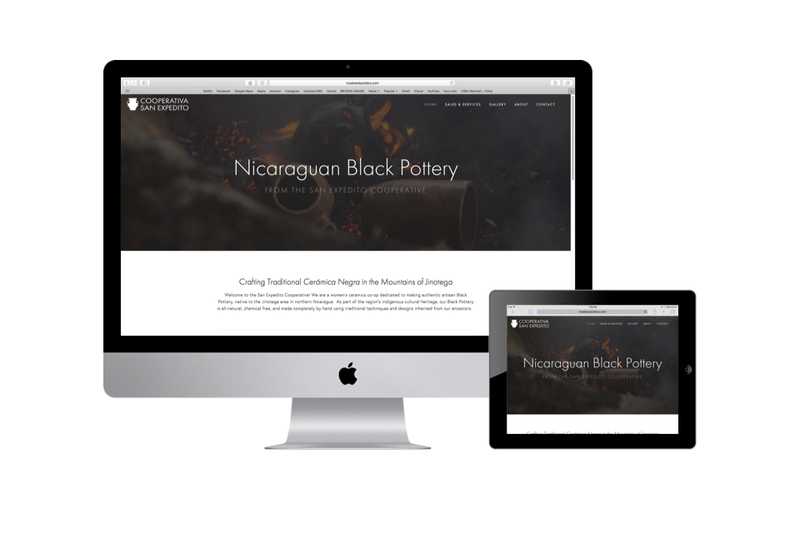 Phase 2 of the project provided comprehensive branding and marketing services and products to support the promotion and development of traditional black pottery. Creative services were made possible through volunteer time, and related products were funded by donors. See some of the services and product from this project below. Professional website, domain registration, and hosting for three years. Facebook and Instagram accounts, and TripAdvisor attractions listing. 15 product catalogs produced, showcasing the co-op's work. 6,000 craft tags for branding and labeling pottery and ceramics. 1,000 promotional stickers featuring the cooperative's logo. 700 business cards for craft fairs and clients with custom orders. 15 custom aprons for associates and pottery tour promotion. Phase 3 of the project provided the necessary tools and essential training to ensure project success and sustainable development. Two electric pottery wheels were donated to the cooperative to alleviate a work-related disability, and boost the production capabilities of the cooperative in response to increased product demand resulting from the book publication and branding and marketing plan. Additional speciality tools are also donated to support the production process and training of more women in the community. Inde Creative supported the project through educational components fundamental to empowering the entrepreneurs and ensuring project success and sustainability. Education included specialized consulting on brand and business development, and tailored training on using the tools and resources provided for successfully marketing and promoting indigenous pottery and the cooperative.